U.S. authorities are working on an emergency deal to import the yellow fever vaccine Stamaril, which is not currently licensed in the U.S.
Come July, the yellow fever vaccine could be tough to find. So, if you're traveling this summer to a place with the disease, you probably want to schedule a trip to a clinic sooner rather than later, the Centers for Diseases for Control and Prevention tells NPR. "Take heed of our warning: Plan ahead," says CDC spokesperson Tom Skinner. "It may be difficult to get this vaccine. And if you can't get it, then you should postpone your trip." The U.S. supply of the yellow fever vaccine will run out by about midsummer, the CDC reported Friday in the Morbidity and Mortality Weekly Report. Officials are working on an emergency importation of an alternative vaccine, which is already licensed Europe, but is not currently licensed in the U.S. Even then, there will be a limited number of doses, available at only a small number of clinics, Skinner says. "We're going from the yellow fever vaccine being available in 4,000 clinics across the country to only 250 clinics," he says. Yellow fever is surging around the world. Last year, a large outbreak in Angola and Democratic Republic of the Congo triggered a massive immunization campaign, in which 30 million people received the vaccine. 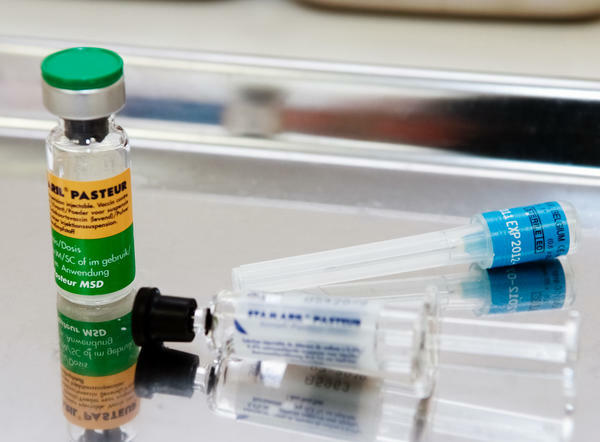 That outbreak depleted the global supply of the yellow fever vaccine several times and forced the World Health Organization to give fractional doses of the shot. Now, a growing outbreak in Brazil has health officials stretching the global supply once again. Health officials are concerned that outbreak could spread across South America and even into the U.S.
"Right now, we don't have enough vaccine for everyone in Brazil," says Dr. Anthony Fauci of the National Institutes of Health. "We're going to have to make more vaccine. And that will take time." There is currently only one yellow fever vaccine licensed in the U.S. The pharmaceutical company Sanofi Pasteur manufactures it. It's called YF-VAX. Back in 2015, Sanofi Pasteur began updating its manufacturing facility for YF-VAX. And it stopped production of the vaccine. The company planned to have enough doses to cover U.S. demand until the new facility opens in 2018, but "manufacturing complications resulted in the loss of a large number of doses," the company writes in the MMWR. The supply will run out in a few months, so the FDA has given Sanofi Pasteur emergency approval to import a second vaccine, called Stamaril. It has a similar safety profile and effectiveness as YF-VAX. It's already approved in 70 countries. It's rare for the FDA to grant emergency approval to import an unlicensed vaccine. The last time that occurred was in 2013 when a meningitis B outbreak hit Princeton University. "The yellow fever vaccine is really important," Skinner says. "We're doing everything we can to make sure people who need it can still get it." If you're taking an international trip soon, check to see if the CDC recommends a yellow fever vaccine for your destination. And, if it does, go get it now, Skinner says.